This next beer brings me back to my old Dungeons & Dragons days. That is correct, I was a dork of the highest order when I was in Junior High. I spent many a night playing D&D (a pen and paper role playing game) in a friends basement battling goblins and orcs and all of sort of nasty creatures armed with my trusty twenty-sided die (oh yeah, I had a nice collection of dice…in a velvet bag). I probably should have been out doing what other normal teen boys were doing at the time…drinking, chasing girls, etc. but that was not me. I was a role playing game dork, a geek…and you know what…I still am and proud of it. That love of all things D&D fantasy wise still lives on with me today in the books I read (Lord Of The Rings, Sword Of Shannara, etc. ), the shows I enjoy (Game Of Thrones), and the PC games I play (World Of Warcraft, Lord Of The Rings Online, etc.). To that end, when I saw beer #204 sitting on the shelf, King Goblin by Wychwood Brewery Company Ltd from jolly old England, I knew I had to give it a go. 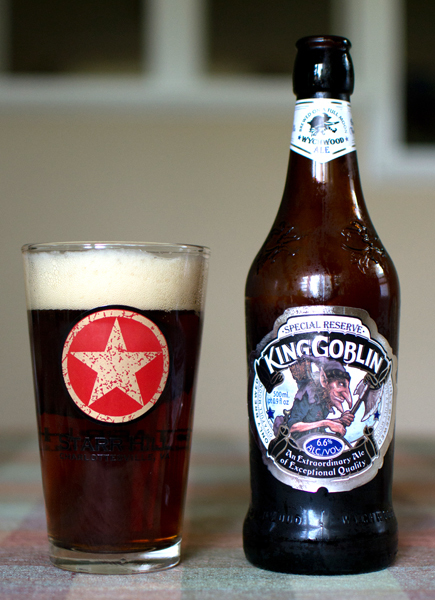 King Goblin is an English Strong Ale with an ABV of 6.6% with a very cool label of a goblin wielding a nasty looking two-handed axe (quite possibly +1 to damage). It has been a while since I used my Starr Hill pint glass, so a quick rinse, a towel drying, and a pour brought me this reddish brown brew with quite a nice fluffy off white head which left some excellent lacing on the side of the glass. The nose was weak though…it mostly consisted of a malty bread like aroma. The taste was also on the light side…with roasted malts and an earthy component. It had a bitterness to it that lingered on well into the grainy aftertaste. The mouthfeel was that of a medium bodied beer with fairly light carbonation. This had me reaching for my twenty-sided die to make a saving throw roll (old D&D term…look it up) against poison. Actually it wasn’t that bad…just pretty average. I did notice for a 6.6% ABV brew, I was feeling the effects of the alcohol more than I should have been. The tipsy feeling was making me think maybe I should join a LARP (Live Action Role Playing)…here is a clip http://www.youtube.com/watch?v=KZ04mfAY2BU…enjoy!